Yeah, There are many situations where it is useful to save your file in a fixed-layout format that is easy to share and print and hard to modify. Examples of these situations include resumes, legal documents, newsletters, and any other file that is intended to be primarily read and printed. Actually The 2007 Microsoft Office system offers a free add-in to save or export this type of file, but you must first install the add-in before you can use it. Other third-party products may also be available to export a Microsoft Office file into a fixed-layout document. PDF is a fixed-layout electronic file format that preserves document formatting and enables file sharing. The PDF format ensures that when the file is viewed online or printed, it retains exactly the format that you intended, and that data in the file cannot be easily changed. The PDF format is also useful for documents that will be reproduced by using commercial printing methods. 1. If your Microsoft Word is version 2007 (GENUINE Required :) ), To save or export a file to PDF or XPS, you should first install the Publish as PDF or XPS add-in for the 2007 Microsoft Office system. This MS Office Add-in allows you to export and save to the PDF and XPS formats in eight 2007 Microsoft Office programs. It also allows you to send as e-mail attachment in the PDF and XPS formats in a subset of these programs. NOTE >> This download is available to customers running genuine Microsoft Office ! - Microsoft Office Access 2007, MS Office Excel 2007, MS Office InfoPath 2007, Microsoft Office OneNote 2007, PowerPoint 2007, Microsoft Office Publisher 2007, Microsoft Office Visio 2007, and MS Word 2007. This download is available to customers running genuine Microsoft Office. In that microsoft page, Click the Continue button in the Validation Required section above to begin the short validation process. Once validated, you will be returned to the page with specific instructions for obtaining the download. >> DOWNLOAD this one? OK, If you choose this option > Just Go to the Microsoft Save as PDF or XPS Add-in for 2007 Microsoft Office programs and follow the instructions on that page. 2. You can try other 3rd party 'Completely FREE' print to PDF utilities like CutePDF (My Favorite), and PDFCreator. 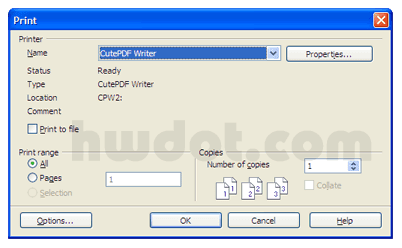 With CutePDF Writer you can create PDF documents on the fly — for Free! Yes, it's FREE for personal and commercial use! No watermarks! No Popup Web Ads! + Supports Microsoft Windows 98/ME/2000/XP/2003/Vista (x32/x64). + Requires PS2PDF converter such as Ghostscript (recommended). > CutePDF Writer - What's New ?? + Added support for both 32-bit and 64-bit Windows Vista. + Added support for 64-bit Windows XP/2003. + Seamlessly integrate with CutePDF Professional. + New version works with the latest version of Ghostscript. + To use with other PS2PDF application, please refer to FAQs. + Supports foreign language Windows better. + No longer include Ghostscript. You may download and install it separately. >> Just go to this OFFICIAL page for FREE DOWNLOAD here. + Security: Encrypt PDFs and protect them from being opened, printed etc. + AutoSave files to folders and filenames based on Tags like Username, Computername, Date, Time etc. And which is also good: PDFCreator is free, even for commercial use! It is Open Source and released under the Terms of the GNU General Public License. 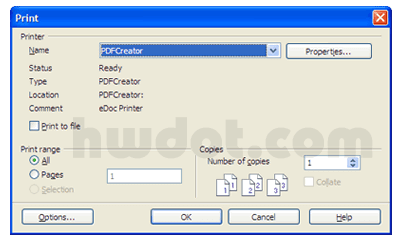 > Download PDFCreator for free here. >> Hope the tips how to 'FREE' convert DOC (MS Word Documents) to PDF Format for Writing Paper, Office Printing and all those freewares can help you to convert all your favourite .DOC documents to PDF for easy printing. 2 comments on "How to Convert DOC (MS Word) to PDF Format for Writing Paper, Office Printing"
i have Microsoft Word is version 2007 (GENUINE) & activated.Microsoft Office Add-in was added but I still don't have the option to save as PDF file.